Okay, this review may be a little biased as I'm a dog person and not a cat person. Dogs are loyal, cats are ... cats, they have their own agendas but with the canines, their DNA is hardwired for packs, hence their loyalty and the term, man's best friend. This is where actor Martin Clunes comes into the fray, another dog lover who takes the viewer on an interesting journey and personal journey about the life of dogs and how these wild animals became one of man’s closest companions. Early in the piece, we learn that Clunes has three dogs himself, each with different personalities and traits but at the end of the day, these pets are family members and Clunes passion comes through magically in this documentary which makes it so enjoyable to watch. Unlike some dry and un-inspirational documentaries, Clunes light hearted attitude and approachability is almost like listening to a close friend talk as his excitement shines through. Interestingly enough, domesticated dogs are genetically linked (99.8%) to wolves which does raise the question of how these wild beasts became loyal friends to man. As Clunes personal history lesson unfolds, we visit a variety of countries from Africa to the United States as we learn what breeding has done to dogs (e.g. genetic disorders), how some dog dovers take their love too far and keep them as surrogate children to more serious matters, like the endangered African Painted Dog. There is also a great scene involving a police dog in the America that highlights the versatility of these animals from work to pleasure and just around the corner, a wolf pack hunting their prey and ironically, we have let these animals into our home. 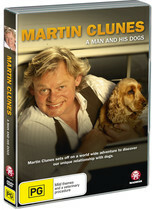 In the end, Martin Clunes: A Man and his Dogs Coming is a perfectly presented documentary with high production values that are mimicked by the video and audio quality. If you’re a dog lover, than this is a must have documentary to your collection and is not only inspiring but quite enjoyable. The only problem with this documentary is that it should have longer but apart from that, highly recommended!